A history of education in the Amherst and Talbot districts between 1836 and 1862. “This is an impressive piece of historical research. 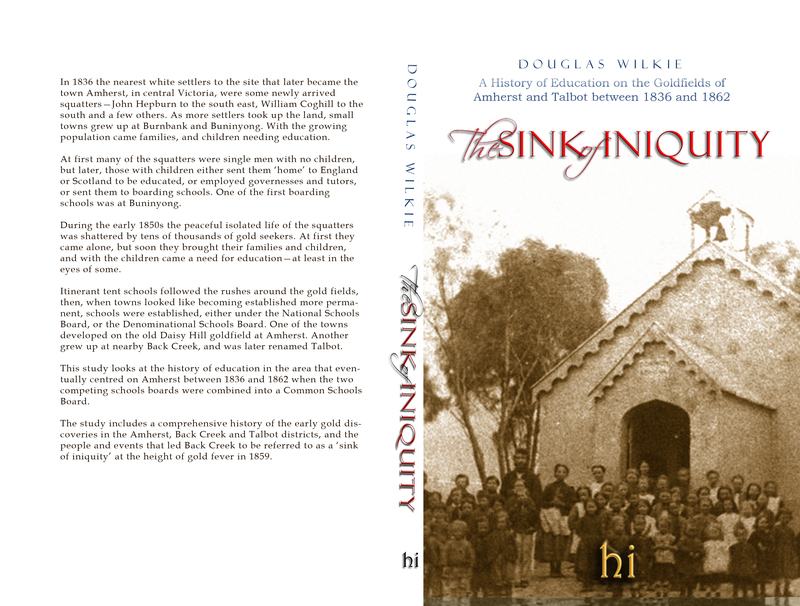 The author has taken a discrete area of early Victoria very directly affected by the gold rushes and has examined the history of schooling in that area over a period of some twenty six years. The result is a narrative that is at once informative and interesting, and gives a valuable insight into the actual functioning of the schooling ‘system’ at the grass roots level under the two boards prior to the Common Schools Act. It highlights the difficulties in establishing schools—the problems of distance with long delays in communication between Local Boards of Management and the central Boards; the lack of funds; the ongoing lack of support from the working people and the reliance on a few individuals to keep the schools going. The thesis is an important contribution to the history of early Victoria. Dr Bob Bessant, La Trobe University. “Crime is alarmingly on the increase, and although the police force has been enlarged, it is still far below the requirements of the immense population. Inspector Ryan has joined the force, and his office is no sinecure; garotte robberies, sticking-up, and fights are becoming alarmingly common. Several cases of shoplifting may be added to the category of offences and one or two cases of selling spurious gold.” Maryborough and Dunolly Advertiser quoted in Argus, Wednesday 20 April 1859, p. 7. “Crime is frightfully on the increase in this district, and the hordes of thieves and murderers on the rush are becoming emboldened from the comparative immunity which they enjoy. At present Detective Slattery and a handful of constables are the only men to keep down hundreds of villains of the deepest dye. The report I have forwarded you, of the murderous attack on Mrs Ross, is only one of several crimes … Several cases of sticking-up have come to our knowledge … A butcher named Wills was pounced on by four armed men near Sault’s Hotel … A woman was stabbed in the face on Wednesday night … On Tuesday night a man had his jaw broken … The feeling among the inhabitants is one of great insecurity. A Court of Petty Sessions will he held daily at Wrigley’s Hotel, on and after Monday.” Maryborough and Dunolly Advertiser quoted in Argus, Monday 16 May 1859, p. 5. Back Creek was experiencing a massive gold rush. The population had reached 30,000. Not only were there murders, robberies and all kinds of other lawlessness, but Back Creek was described as the very sink of iniquity. In the midst of all this were the children and the desire to provide them with some form of education to prevent them falling into heathenism and barbarianism. But the Denominational Schools argued with each other. The Presbyterians would not allow their children to attend the Anglican schools. The teachers were often untrained and just as susceptible to the lure of gold as the parents. The Boards of Education took months to pay bills and salaries. This is the story of how education was provided to the children of this district, from a time long before the gold rushes, a time when the only children were those of the squatters and their servants, through to 1862 when the Common Schools system established in an attempt to overcome the inter-Denominational rivalries, and to avoid wasteful duplication in communities that could barely sustain one school, let alone two or three.